Download "WHAT S NEW IN. Microsoft Dynamics NAV 2013. Microsoft Dynamics NAV 2013 KEY BENEFITS:"
1 WHAT S NEW IN Microsoft Dynamics NAV 2013 Microsoft Dynamics NAV 2013 Get ahead. Shape your own future. Today more than ever, small and midsize businesses like yours need solutions that drive success. Microsoft Dynamics NAV 2013, a complete business solution from Microsoft, delivers loads of enhancements and new features designed to help you accomplish this mission by gaining greater control over your business, improving your margins, and driving growth. KEY BENEFITS: Powerful application functionality like Cash Flow Forecast, Cost Accounting, Assembly Management, Timeline Visualization, and other capabilities like improved query and charting enhance data access, analysis, and presentation for more users. This fosters deeper insight into the operations and processes that drive your company, helping you to gain greater control. Improved margins can follow when you empower more of your people to work more efficiently and productively. Exciting new features and enhancements like Microsoft Dynamics NAV 2013 web client, SharePoint client, refined RoleTailored capabilities, and increased general ledger flexibility extend the power of Microsoft Dynamics NAV 2013 throughout your organization. Faster time to value is possible because it s easy to learn Microsoft Dynamics NAV 2013 and get it installed and running quickly, whether you deploy on-premises or in the cloud. We can help Success is about more than growing your business in the near term. It s about sustaining profitable growth over the long term. Getting the most out of your business investments, including your IT, contributes to this goal. Your Microsoft Dynamics Business Ready Enhancement Plan (BREP) helps you: Upgrade to the latest technology to increase the productivity of your team. Get more out of your IT investment. Chart a technology roadmap that keeps your business on the forefront of innovation. You re in control Microsoft Dynamics delivers the vision, tools, and support you need to get ahead of changing business conditions and the competition but at the end of the day, you re in charge. Set the pace that fits your situation. Deploy on-premises or in the cloud. It s your choice. You re in command. Microsoft SharePoint integrations in Microsoft Dynamics NAV 2013. 2 2013 Business is changing. You notice it every day. The tempo is quicker. Customer tastes and competitive dynamics change in a heartbeat. Your market is evolving, with customers and prospects in new cities, and maybe even new countries. The way people work is changing too. A more virtual world creates opportunities for businesses that support efficient remote and mobile employees. And when every interaction and transaction counts, you need greater visibility, insight, and control to make the informed decisions that boost your bottom line. Reacting to change can stretch your current accounting software and business applications. Every new tax, regulation, and business requirement seems to expose a new deficiency. IT creates patches and workarounds to bridge gaps and squeeze one more drop of productivity out of your systems, but this approach cuts into margins, and a growing portion of your IT budget disappears into software maintenance instead of funding projects that add business value and drive growth. Upgrading your accounting and business software becomes more urgent every day, but you worry about complications. Along with budgetable expenses, you wonder about the potential for unforeseen costs. Factor in the risk of project delays and interruptions to critical business processes. All in all, it s tempting to delay an upgrade until you gain more confidence that the result will be predictable and positive. Microsoft is committed to help you upgrade with confidence by delivering a comprehensive vision and solution for your business. The next release of Microsoft Dynamics NAV renews our promise to deliver ongoing value and innovation. Consistent product releases, costeffective to deploy and easy to implement at your pace, help you transform your business. With Microsoft Dynamics NAV 2013 you can: Gain end-to-end visibility and greater control over what s going on in your business, helping your people make smart, timely decisions and get more done. Get ahead of changing conditions, and stay ahead, by streamlining your business processes. This helps you control expenses, improve the bottom line, and drive business growth. Optimize your IT investments and shorten the time to value with a flexible solution that s simple to learn and use. Microsoft Dynamics NAV 2013 works like and with other Microsoft technologies such as Microsoft Office and SharePoint, and with other business software you may already use. All of this improves your margins and enhances the bottom line, generating cash to drive business growth and helping you to shape your own future. Put your people in command of your business Give them fast, convenient access to the information they need to collaborate and manage, and you will empower them to control your future. Cost Accounting: Gain greater visibility and insight into how your business is performing by monitoring budgeted and actual operating costs, departments, products, and projects. Synchronize cost information with the general ledger and allocate costs to different cost centers and objects. Spot budget variances as soon as they occur and take appropriate action. Cash Flow Forecast: Analyze cash flow and take action quickly. Understand your current cash position, forecast short-term cash flow, and monitor cash receipts and disbursements. Create multiple cash flow forecasts for different time periods. Deliver roleappropriate cash flow information via Role Center screens. 3 Assembly Management capabilities help you optimize inventory levels while maintaining superior customer service in assemble-toorder and assemble-to-stock processes. Assembly Management integrates with the complete Microsoft Dynamics NAV supply chain suite, including Sales, Supply Planning, Warehousing, Inventory Management, and Item Tracking, to help streamline operations, reduce costs, and expedite order fulfillment. Reporting Enhancements: Take advantage of new reporting enhancements made possible by the tight integration of Microsoft Dynamics NAV 2013, Microsoft Excel spreadsheet software, and other Microsoft technologies to help boost productivity for more users and drive decision-making processes for better control. Item Availability by Timeline and Event: Use new business data visualization capabilities, including Timeline Visualization, to view and analyze item availability in Microsoft Dynamics NAV Availability Timelines offer an immediate graphical view of expected inventory for a specific item or SKU over time, or by demand or supply event. Supply Planning Enhancements help control planning suggestions and optimize supply according to inventory and ordering cost. Specific enhancements include new reorder period fields for time bucket, rescheduling period, lot accumulation period, and overflow level. Streamline Warehouse Operations: Strengthened integration between Manufacturing and Warehouse Management, Service Management, and Assembly Management to improve inventory accuracy and reduce stocks, freeing capital for other investments. Move items to and from internal departments more efficiently, and align the process of shipping service items with warehouse operations. Job and Service Management: enhancements deliver greater insight into and control of work-in-process calculations and service processes by allowing you to see all supply and demand associated with specific items. Enhanced Cash Flow Forecast in Microsoft Dynamics NAV 2013 helps you to analyze cash flow and take action quickly. Microsoft OneNote Integration is supported by Microsoft Dynamics NAV 2013, so you can use this flexible productivity tool on a rolespecific basis for tasks such as creating Help and Information messaging, and for sharing information, including photos, videos, and other unstructured information, more efficiently. 4 Drive efficiency up and cost down Make more users more productive. Simplify day-to-day functions and processes, and you will decrease operating expenses while improving cash flow. Extending the Reach of Microsoft Dynamics NAV 2013 through Microsoft SharePoint and the Web Client: Empower users throughout your company to access Microsoft Dynamics NAV from virtually any device that supports a web browser. Microsoft Dynamics NAV 2013 Web Client, a simplified version of the RoleTailored client, allows more employees, especially occasional users, easy, security nhanced access to relevant information without the requirement for complex system customization work. Through Microsoft SharePoint, you can set up websites to share Microsoft Dynamics NAV 2013 data and information, such as pages and reports, with more people inside and outside the company. Any changes to Microsoft Dynamics NAV 2013 pages on a SharePoint site are updated instantly in Microsoft Dynamics NAV RoleTailored User Experience Enhancements expand RoleTailored functionality for users through improved charting capabilities and other productivity enhancements. 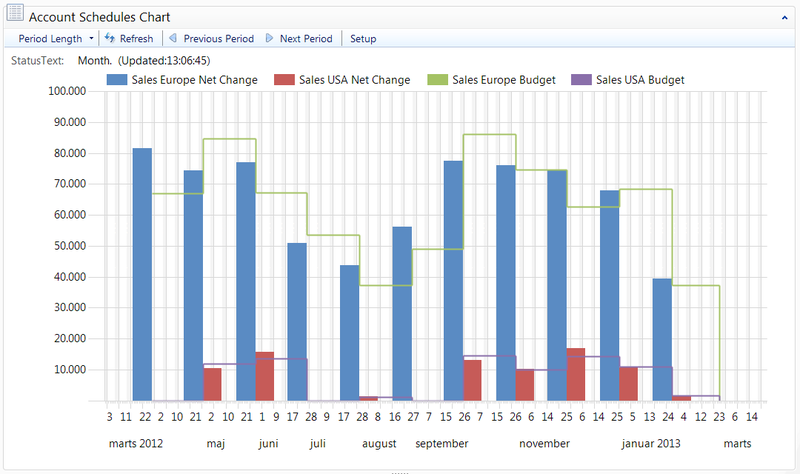 End-User Charting: Take advantage of unique charting and visualization capabilities in Microsoft Dynamics NAV 2013 to help users see and understand data from across your business, and then to take prompt, informed action. Flexible, configurable chart types and charting capabilities give users a simple way to drill down into details from a chart or visualization, fostering improved analysis and better control. With new configuration and data aggregation tools and more chart types available in the RoleTailored client, it s possible to add a chart to individual Role Centers or other areas within the application, change the chart definition, show it in three dimensions, flip its axis, and print it. From any list place, you can change the view of the data to display it in a chart format. And you can add a FactBox that contains a chart, which can be customized. Grouping on Pages: New functionality enables display of content in tabular format. Query: A data pump capability improves impromptu reporting through improved access to data in OData (Open Data Protocol) web service allows you to create compelling self-service business intelligence solutions. Visual Updating of Client to Office 2010: The Action Pane redesigned and renamed the Ribbon and improvements to Fast- Tabs and FactBoxes add to the ease-of-use of Microsoft Dynamics NAV User Productivity Improvements: A host of enhancements, including Select All, Copy/Paste, Link Sharing and Copy Link, Find, Quick Entry, and the ability to enter filtering formulas and save variables, all familiar actions to users of other Microsoft products, now empower your people to work smarter, more efficiently, and more collaboratively with Microsoft Dynamics NAV General Ledger Table Locking Architecture and Dimension Posting and Storing Redesign: Speed up posting processes by enabling more users to post sales and purchase orders at the same time. Improve analytical capabilities with more robust capabilities for storing data dimensions. New and unique charting and visualization capabilities allow users to see, understand, and act on data from across the business and display compelling KPIs in the Role Center. SERENIC NAVIGATOR. Customizable ERP Solution for Advanced Nonprofit and Public Sector Requirements. The Beginners Guide to ERP for Food Processors Technically, ERP stands for Enterprise Resource Planning software, but really it could stand for Everything Right & Profitable or Easier Realized Profits. Microsoft Dynamics NAV 2015 What s new? Cognos e-applications Fast Time to Success. Immediate Business Results.